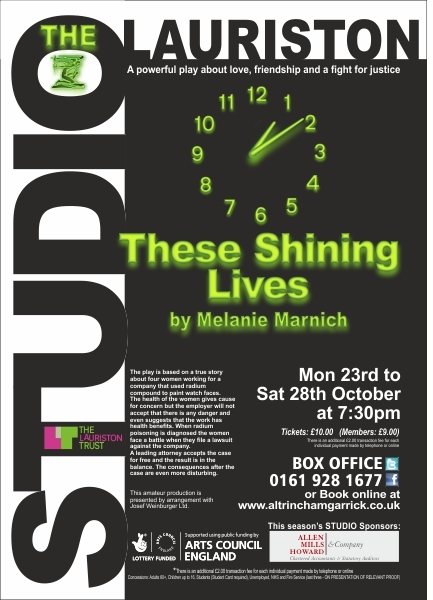 THESE Shining Lives by Melanie Marnich, at Altrincham Garrick?s Lauriston Studio reflects the world of workers in an Ottawa, Illinois watch making Factory. Based on a true case from the 1920s, it features four women workers. Initially, they are delighted at the freedom work gives them and enjoy the camaraderie. Slowly it dawns on them that all is not well, especially with Francesca Heraghty-Smith?s Catherine Donohue, the uncrowned leader of the group. The other three workers at the Radium Dial Company are Emma Toms as pious Frances O?Connell; Megan Relph as Pearl Payne, the jokey one and Marcella Hazell as the gin drinking rebel, Charlotte. There are some good male actors including Jamie Sloan as Tom Donohue, Catherine?s husband and Ian Fensome who plays Mr Reed, the apparently uncaring factory boss. The happy relationship between Catherine and Tom provides some delightful cameos within this well-written, moving play. But it?s the women who are the true stars and we watch their transformation from happy go lucky to lack lustre with sadness. Theirs is a life-long camaraderie well put over by the four actors.? They don?t realise it but by painting watch dials with radium and licking the brush, they are slowly poisoning themselves. Eventually, just before Catherine?s death, they win their case against their employer who makes six appeals before the women?s victory at the Supreme Court. Director, Parissa Zamanpour brings out the happiness, humour and eventually great suffering of the women as their bones turn bad with radium poisoning. This thought-provoking play is well worth seeing.